Over 100 Celtic supporters packed into the Lurgan Celtic Supporters club recently to relive the glory days of Belfast Celtic. Delegates travelled from all across Ireland for the Association of Irish Celtic Supporters Clubs' annual meeting and the green carpet was rolled out in Neil Lennon's home town for Charlie Tully Jr and Davy McKavanagh, who took the packed house on a barnstorming walk back in time. As part of the celebration of the life of Charlie Tully in his 40th anniversary year, the Belfast Celtic Society was delighted to accept the invitation to address the gathering and offer a bit of sporting nostalgia to the very important event. Once again, the magical Bill McKavanagh slide show was presented to the audience, who listened intently as the Celtic roll of honour played out down through the years. Maria Foy (AICSC), Andrew Milne (centre), editor of the Celtic fanzine More than 90 Minutes, with Charlie Tully Junior. Davy McKavanagh then sketched his own Celtic odyssey and detailed the importance of Belfast Celtic to the fabric of the city and reminded the audience of the Celtic Song's Irish origins. Patrick and Malachy McKavanagh were also in attendance. Charlie Tully was the key focus for the aftershow debate and his eldest son painted an emotional and touching picture of his father. Cheeky Charlie's name was taken in vain on several occasions as his hilarious off field antics were played out alongside the on-field excellence which flowed from his magical boots. 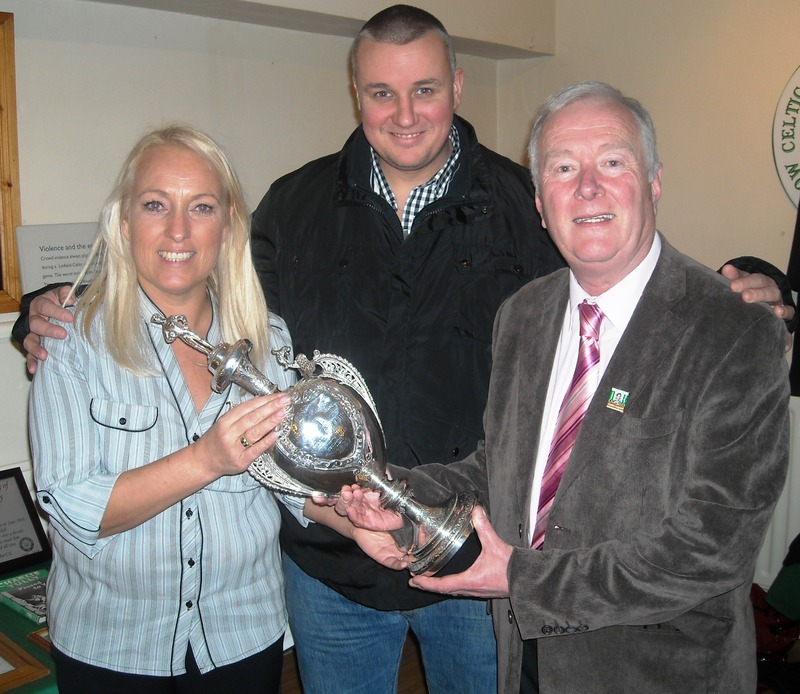 Many of the Tully artefacts from the Belfast Celtic Museum were also on display at the Lurgan CSC, the only club in Ireland with it's own premises, while the Irish Cup was also on display, courtesy of the Irish Football Association. After the event, an elated Charlie Tully Jr said; "It was such a privilege to be among such esteemed Celtic people and it was truly an event to savour. Seeing the whole crowd on their feet belting out the Celtic Song at the finale was a moment to treasure forever." "On behalf of the Belfast Celtic Society, I would like to extend our gratitude to Maria Foy and Jim Kelly from the organising committee for their incredible hospitality and more importantly, their interest in Belfast Celtic and my father in particular. Spreading the word about the Grand Old Club is our pleasure and to recieve such a rapturous welcome from Celtic fans from around Ireland was very humbling. Events like this will ensure the famous club is never forgotten."